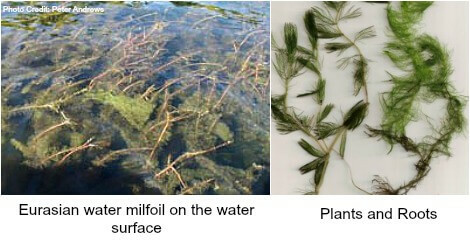 If a ‘top ten’ list of aquatic invasive plants existed, Eurasian watermilfoil (Myriophyllum spicatum) would top the list of non-native water plants that pose the greatest threat to Georgian Bay and its watershed. Native to Europe, Asia, and northern Africa, Eurasian watermilfoil (EWM) was first discovered in a Washington, DC pond in 1942. EWM has since spread throughout the continental United States. 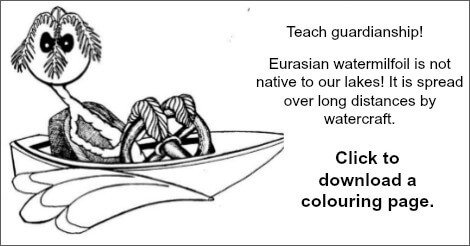 The invasive plant is present in the Canadian waters of British Columbia, Manitoba, Ontario, and Quebec. The 2018 University of Georgia Early Detection and Distribution Mapping System has identified 72 sites along the Georgian Bay shoreline where EWM has been observed. However, it is believed that many more sites exist between Bayfield Inlet and Collingwood Harbour due to the rapid growth and spread of the plant species and the lack of knowledgeable observers. What does EWM look like? EWM is an aggressive rooted aquatic perennial plant. It has delicate, feathery leaves. The leaves are mostly the same length; the tips have a snipped off appearance. Leaves are arranged in whorls (circles) of three to five leaves around each stem. The stem is thick or thicker than a pencil, and is long and spaghetti like in appearance. Stems typically grow .9 – 3 metres (3 -10 feet) in length. Some EWM plants can grow to 9 metres (30 feet) in length with the majority of the plant branching at the surface. Due to the similarity between EWM and two other milfoil species…Northern Milfoil (a native aquatic plant) and Hybrid Milfoil (a cross between EWM and Northern Milfoil), verification of EWM should be undertaken by a biologist or an ecologist. How does it grow and spread? EWM grows quickly and spreads easily. Studies have shown EWM to grow 5 - 7 cm (1 – 2.75 in) per day in ideal growing conditions. It grows in depths up to 8 metres (26 feet) of water…deeper depths if the water is clear. EWM grows in any type of aquatic substrate; however, it prefers sand and silt substrates. EWM has the ability to grow over a broad range of temperatures (15⁰ C - 35⁰ C). Although EWM produces seeds, the plant primarily spreads through its root extension (runners) and through plant fragmentation. Fragmentation can occur by breakage from wind and wave action, contact by waterfowl, animals, and fish as well as human activity such as boating, angling, and swimming. EWM also ‘auto-fragments’ towards the end of its growing cycle; stem and leaf parts are naturally separated and dispersed. Localized spread is primarily through its root extensions, intermediate distance spread is by plant fragments, and long distance spread between water bodies is primarily through the transport vector of PWCs, boat motors, boat trailers, fishing gear and bait buckets. Each plant fragment is capable of growing roots and developing into a new plant. An example of the spread capability of EWM is a 36 island archipelago in Lake Huron known as Les Cheneaux Islands. A small 250 square foot patch of EWM was observed to grow to 400 acres over a six year period. The ugly facts…why EWM is a concern. Recreational activities such as boating, fishing, and swimming are impeded by dense growth at or near the surface. Water related tourism, hospitality, and retail services such as marinas can be impacted. Shoreline property values can be de-valued. EWM choked water bodies can depress real estate values up to 20%. The water body’s ecosystem will be altered. EWM will displace important native plants thus harming fish and wildlife habitat. Dense floating vegetation becomes breeding habitat for mosquitoes. Stagnant oxygen-depleted conditions are often found in association with dense beds of EWM. Fish mortality may occur and degraded water quality could contribute to algae blooms. Costs to manage EWM growth are borne by local citizens and businesses, lake management organizations, and/or local governments. What are the viable control options? To initiate proactive action and hopefully eradicate the invasive plant, EWM must be detected in its early stages of invasion. Once established, EWM is extremely difficult, and very costly to control. In larger water bodies like Georgian Bay, only localized control of high risk areas is economically and environmentally feasible. A significant and sustained investment of resources over the long term is required to achieve maintenance control. There are many control methods but there are is no silver bullet to make the problem go away. There are no viable biological control methods. With smaller less dense infestations, hand harvesting plants aided by a DASH (diver assisted suction harvesting) is an expedient method of controlling EWM. The aquatic herbicide diquat dibromide (brand name Reward) can be used for spot treatment of infestations; Reward is the only aquatic herbicide approved for use in Canada. The aquatic herbicide only retards the growth of the EWM; it does not kill the invasive plant. In small high risk areas (e.g. boat launch sites, swimming areas, etc.) a jute benthic mat (bottom barrier) is a feasible method to manage EWM. As the EWM problem intensifies, more complex, costly, and controversial control methods can be employed to manage the EWM issue. The control methods include mechanical harvesting, rotovation, laminar flow aeration, and dredging. We are dealing with a critical aquatic invasive species that could affect the long term health of areas in the Georgian Bay and within its watershed. Proven effective control methods are limited. EWM growth and spread can outpace control efforts. Although eradication of EWM in Georgian Bay is an unattainable goal, we have an opportunity to slow its spread. Due to the lack of external financial support from either the provincial or federal government, necessary funding will have to be provided by those who benefit the most from EWM control efforts…..shoreline property owners, businesses, and municipalities. These stakeholders must invest in the future of Georgian Bay. We must find new ways to work together in a cooperative manner to find solutions to the threats of aquatic invasive plants. We must identify stable funding sources. We must focus our combined efforts so they are in line with available resources. We must inform, educate, and engage stakeholders. Eurasian watermilfoil is the stealthy invader now, but there are other non-native plants that will invade Georgian Bay in the future. We must remain vigilant, proactive, and committed to protecting what we value. Author - Peter Andrews, Eurasian watermilfoil Control Project Coordinator for Farlain Lake Community Association. Peter Andrews knows Eurasian watermiIfoil (EWM), and we thank him for sharing his expertise and his passion. He has been researching the plant’s characteristics for the past six years, and has written numerous articles for the Farlain Lake Community Association as well as articles for the Federation of Tiny Township Shoreline Associations' (FOTTSA) newsletter Tiny Cottager. He continues to research various control methods that are applicable to EWM management, which is pertinent to his hands-on role as the EWM Control Project Coordinator - helping his community manage this plant. If you would like to share your story, and efforts fighting aquatic invasives - please contact heather.sargeant@gbf.org. This invasive is especially broken up and spread with boat motors. PLEASE don't drive in areas with Eurasian Watermillfoil - bring your motor up and coast in if possible.~Anne Stewart, Georgian Bay. Every Invasive has the potential to be a top 10. Each invasive has the potential for being a number one problem in your favourite water way in Georgian Bay. unless it is caught early and dealt with quickly. With no natural controls, inaction leads to incredible spread and high costs. We thank Peter and so many others for their action and additional work in sharing information! What does GBF do and what can I do? GBF informs on invasives to help recognize them early or prevent their transfer. Early detection and rapid response are the best defence against invasives. We are especially focused to invasive Phragmites or European common reed which we have a goal to stop in Georgian Bay. In fact we've helped and shared information with over 28 Georgian Bay communities in order to drive identification of invasive Phragmites and to take effective action. If you want to learn more about detecting and mapping invasives, please go to EDDMaps Ontario and download the app. Click here . Aside from Phragmites, here is an 8 minute video of the top 5 watch list (2016) from the Ontario Invasive Plant Council. Click here for the video. We understand invasives can only be stopped with great collaboration. We work with many organizations, and enjoy growing partnerships to do so. Participating in Invasive Species Awareness Week more info , lead by the Ontario Invasive Plant Council is one example of so many rewarding partnerships to help protect the environment. To see other partners, click here. We won't stop fighting for the aquatic creatures of Georgian Bay and their habitat. Not only will we continue to inform communities about invasives and build on our successes with Phragmites eradication, we will continue to find innovative ways to monitor Georgian Bay's biodiversity so we can point out dangers to policy makers to allow for protection measures to be put in place before it is too late. Find out about these leading edge monitoring strategies and equipment: DNA barcoding and an autonomous underwater vehicle. Georgian Bay Forever is a charity that works on protecting your water through scientific research, education, partnerships, and rehabilitation efforts in Georgian Bay. One of our projects is to train, educate, and partner with communities and organizations to tackle invasive Phragmites which can take over beaches and shorelines. Invasive Phragmites are taking over shorelines. Join a local Phragbuster group in your area of Georgian Bay, or reach out to us to start one. Please donate to Georgian Bay Forever! Every donation is so important to us to continue projects and education efforts that help protect the water of Georgian Bay.